Sneyd Wharf is a minor waterways place minor waterways place place on the waterways major waterways place village town city on the Birmingham Canal Navigations (Wyrley and Essington Canal) between Sneyd Junction (Junction of Wyrley and Essington Main Line and Wyrley Branch) (½ furlongs to the west) and Birchills Junction (Junction of Wyrley and Essington and Walsall Branch Canals) (1 mile and 5 furlongs to the southeast). The nearest place in the direction of Sneyd Junction is Sneyd Junction Bridge; ½ furlongs away. The nearest place in the direction of Birchills Junction is Sneyd Wharf Toll Stop; ½ furlongs away. Although Nicholsons and Pearsons both show a visitor mooring here, it doesn&apos;t actually exist. 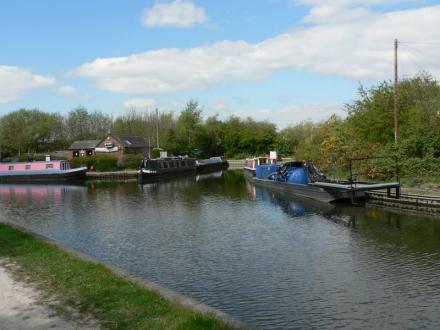 Many boats do moor overnight on the service moorings or in the arm to the right of the s/stn. Information last edited Wednesday the 11th of January, 2017 at 6:17 PM by Shultzy. Walsall — 363 yards to the northeast. 51 Keats Road, Willenhall, WV12 5 HY — 761 yards to the southwest. Walsall — 1495 yards to the southeast. Fryers Rd, Walsall, WS2 7LZ — 1113 yards to the southeast. 145 hight street bloxwich, Walsall, WS3 3LG — 1264 yards to the east. Walsall, WS27DL — 1442 yards to the southeast. Walsall, WV12 5 — 1277 yards to the southwest. Bloxwich — 1131 yards to the southeast. walkers fold, Willenhall, WV125PB — 1395 yards to the southwest. 206 High Street, Walsall, WS3 3LA — 1286 yards to the east. 132 HIGH STREET, Walsall, WS3 2DG — 1433 yards to the northeast. 118 Lichfield Road, Willenhall, WV12 5BB — 1441 yards to the west. 156 High St, Walsall — 1299 yards to the east. Walsall — 165 yards to the north. Walsall — 1537 yards to the east. Walsall — 1296 yards to the north. bell lane bloxwich, Walsall, WS32JW — 1258 yards to the northeast. Croxdene Avenue, Walsall, WS3 2 — 852 yards to the northeast. Queens Parade, Bloxwich — 1301 yards to the east. Farmdale Grove, Bloxwich, WALSALL — 1289 yards to the north. Davis Road, Willenhall, WV12 5, United Kingdom, Walsall, WV12 5 — 1214 yards to the west. Wolverhampton — 1522 yards to the west. 83a Park Rd, Bloxwich, WS3 3SW — 1354 yards to the east. Bloxwich — 1273 yards to the northeast. Walsall, WV12 5 — 1495 yards to the west. 156 High Street, Bloxwich, WS3 3JT — 1299 yards to the east. Bloxwich — 1399 yards to the northeast. Walsall — 1348 yards to the northeast. Parklands Court, 56 Park Road, Walsall, WS3 3ST — 1449 yards to the east. Broad Lane, Walsall, WS32TH — 1296 yards to the north. Bloxwich — 1433 yards to the northeast. Shrewsbury — 610 yards to the north. 130 -132 Harden Rd, Bloxwich, WS3 1ET — 1433 yards to the northeast. Byland Way, Walsall, WS3 — 1025 yards to the north. Walsall — 1282 yards to the east. Bloxwich, Walsall, WS33HL — 1433 yards to the northeast. Harrison Street, Walsall, WS3 3 — 1514 yards to the east. Willenhall North, Walsall — 1407 yards to the west. Paddock, WS2 7 — 1330 yards to the southeast. Walsall, WS3 2 — 1123 yards to the northeast. 1354 yards to the east.